Have you tried the broccoli salad from the Ottolenghi cookbook? Quickly blanched broccoli, grilled to add smokiness, with garlic, oil, chili flakes and thinly sliced lemon. Would be nice with purple! 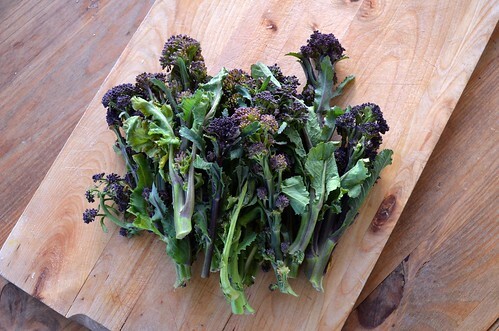 I have never seen the purple sprouting broccoli at any of our markets. I love the beautiful color…maybe next year I might try growing some. I’ve never tried it, but they are SO SO SO pretty. I really want to try these – they are hard to find here. Thanx for the pics, YUMM, YUMMMM, YUMMMMMie!!! I will be looking for this in my Minneapolis Farmers Markets …. The broccoli is beautiful…I’ll have to look for it here in North Carolina (and the recipe sounds great…thanks for sharing!). It is so great, one of my favorite vegetables to grow, and very hard to find in markets here. You’re right, it is sweeter than standard heading broccoli. I just wish E liked it as much I as do. Oh well, more for me! Your pasta dish sounds wonderful. The perfect comfort food for a chilly Spring (?) evening ! I’ll have to wait till next week when The Carnivore is on his travels , though . That purple broccoli is so pretty Wendy, I do wish we could get it here. Love your pasta dish. 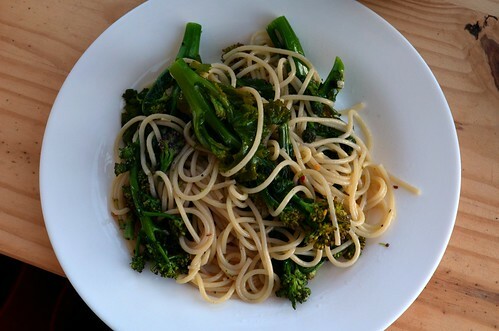 A common home-alone dinner for me is a big batch of the Heston Blumenthal broccoli recipe on The Wednesday Chef, tossed through pasta with some extra olive oil and lemon juice. If I’m feeling “fancy” I’ll toss through some toasted pepitas. Delicious. I like the idea for your series of posts on the market produce you purchased. Looking forward to the rest. 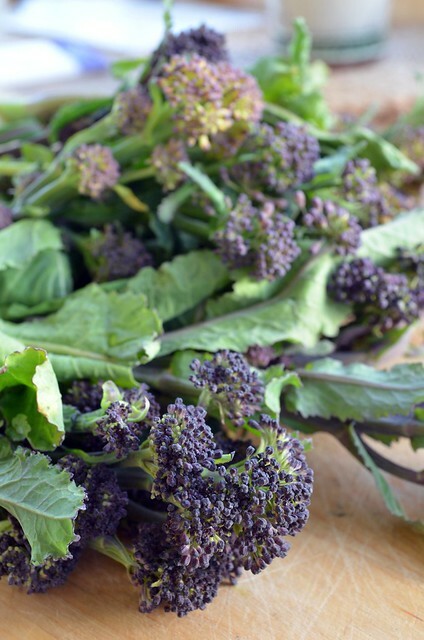 We at http://www.cookalot.co.uk love purple broccoli and we try to keep our recipes simple so we can appreciate even more.